John's parents may have been living in Castlerahan when he was born, since there is a family plot in the parish churchyard there. John buried his baby son John there in 1830 next to older family gravestones with the family crest on them, so says George R. K. Smith. George's grandfather James Smith is also buried there. Alternatively, John may have been born in Cavan Town, where his father is known to have lived in George's lifetime and had a cloth store there. After John married Jane Keating at her father's church in Edgeworthstown, they likely moved to where his Keating great grandparents had lived on Market Street in Kells. John had a cloth store here, and gradually added other business ventures. He rented farm land from landowners and subletted it to farmers. The cloth store eventually moved across the street, where there were stables and other outbuildings behind it. When their home was changed to Headfort Place just east of the Catholic church, they operated a brewery on that property. These pursuits were quite successful, and the Smiths lived a very comfortable life for a while. However, prospects in the United States were attractive to the Irish, even before the famine. One of John's aunts had married a distant cousin named James Clinton, an Irish-born general and politician in the United States and father of Gov. Dewitt Clinton of New York. The latter Clinton convinced John to move to America in the 1820s. The Smiths went so far as to pack twenty wooden cases for the trip, but were then convinced to stay. In 1841 John was appointed a magistrate for Kells. The 1840s were terrible for Ireland not only because of the potato blight, but also an economic depression and the outbreak of livestock disease. All three situations impacted the Smith's businesses, and by 1848 they were in danger of losing everything. John apparently gave over the financial welfare of the family to his son George, who scrambled to sell whatever assets they had. They sailed to New York on the Caleb Grimshaw on August 3rd, 1848. Oddly, John's name isn't on the passenger list, nor any other, indicating it was simply an omission. The Smiths settled in Cincinnati, Ohio. 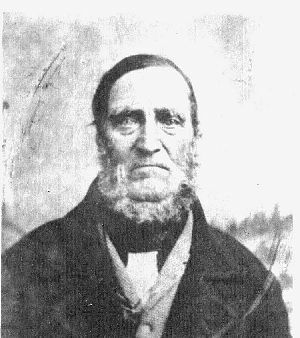 The 1850 census says that John was a merchant, but he isn't listed in the city directory for that year or any other years. It's most likely that the family was supported for the most part by George, who probably started out with a lumber yard, then became a bookkeeper while in Cincinnati. John and Jane moved with George and his own family to Brooklyn, were John died of a stroke at their house on Hart Street. He was brought back to Cincinnati and buried in the family plot at Spring Grove Cemetery. George was extremely fond of his father and his kind, loving nature. The photo of him late in life (above) is said to reflect his dejected feelings about how life had turned for the worse. The photos below were taken probably by Robert Keating Smith. 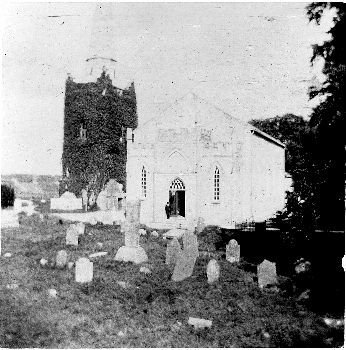 St. John's Church, Edgeworthstown, where John and Jane were married by her father, the vicar. 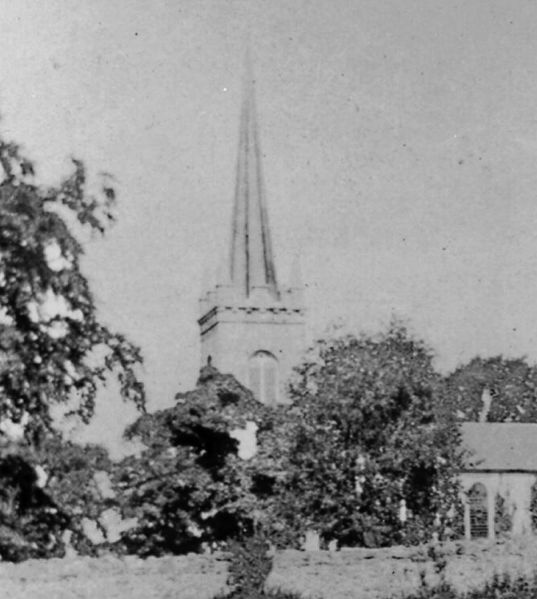 This photo shows the steeple before it was altered to its current appearance. sources for vital records: John's birth information is from notes made by his grandson Stanton M. Smith. His marriage is recorded in a family Bible and is described in the reminiscenses of John's son George. There is a Brooklyn municipal death certificate for John (1866, #5788). all text and photographs © 1998-2013 by Doug Sinclair unless where otherwise noted.